Well the season has kicked off and there is a lot to talk about, but little time to talk about it. We began this season with no major changes. Actually, we made NO changes at all besides the fuel and oil, come to think of it. The budget is already tight going into this and so we just showed up to Desert Center, California March 30-31 to get things going. The important part of the 2013 story is the loss of our main rival, Becker Moto Works. They have decided to go full force into their vintage sidecar racer. Bill Becker now has four of the machines in various states, with once complete and ready to race. Hoping to showcase the bikes (as all of them are for sale or possible rental), they will contest the three rounds on the SRA-West series that team up with national vintage series AHRMA. That actually puts Team Johnny Killmore out in the front and fairly alone this season. There will, however, be wildcard entries to test our mettle. Round 2 and 3 are just a few weeks away and will feature fast teams on F2 outfits similar to our own. 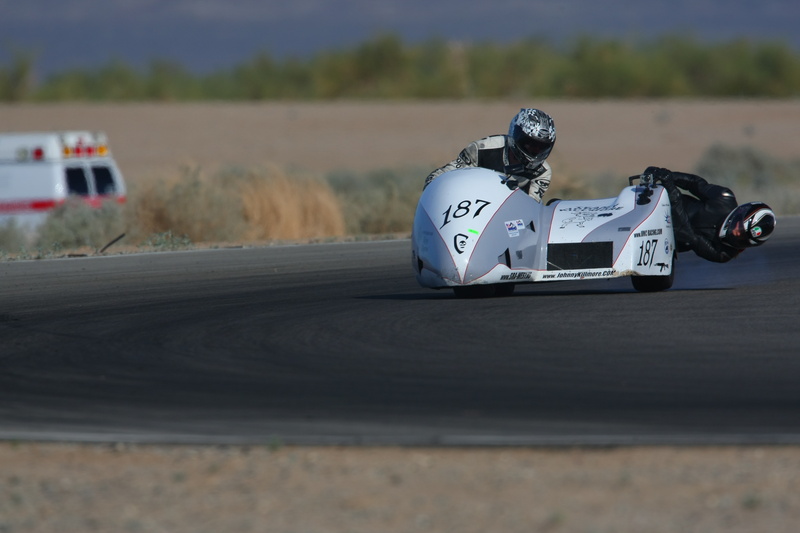 Subculture Racing- who competed with us at the 2012 Pikes Peak Hill Climb- will be at round 3 with AHRMA at Sonoma Raceway. Back from Brazil, Mark and Bobette Burdick will most likely pull their F2 machine out of storage and make both round 2 and 3. I have never been able to beat them in a heads up race, but I also have dropped a bit of time off my personal lap records in years past. The next 3 weeks will be the highlight of my short-circuit season. Now, lets get back to the story at hand. This is only our second trip to Chuckwalla Valley and Gina’s first. The track is a little longer than we are used to, and it was a hot weekend (well, 90 degrees is hot this early in the spring at least). This did not seem to deter us. Gina was on her game and I was concentrating on smoothness, which beats her up a lot less. The two-day format featured short practice sessions and two 6-lap sprint races, as usual. With the practice times showing us comfortably ahead, I decided to start from the back to give us practice in traffic. Away we went on the short run to Turns 1-2, sneaking around the outside of several teams, now in about 6th place of the nine bikes that started. Through the double-left,double-right sweepers and we grabbed some more spots. We found ourselves in third about halfway through the first lap, with Stull Racing’s Steve Stull/Heidi Neidhoefer leading second place Team 321 (Donn Sayre/John Heenan). We reeled them in rather slowly actually, taking about an entire lap to get within striking distance. They both seemed to have the measure of us in the several right hand corners on the track (we were running in the clockwise direction). We could eat up ground in the lefts and on the brakes though, and made a move entering turn 4-5, a double-left complex. We then stuffed it into the lead on the brakes entering turn 6, but Stull was having none of that and passed us back exiting turn 7. Up to the roller-coaster chicane of turns 8-10, we got inside on the brakes and stumbled through the chicane, offline. This series of corners ends in a right, and Stull again drove passed us on the exit. This leads to an uphill straight cresting at a quick right-left downhill section. Although Stull got ahead of us he did not slam the door. This gave him the inside line but he would have to brake first. When he did we shot by, braked like hell, and stuffed it in. Keeping the throttle steady instead of opening it as usual, Gina was able to make the fast transition into the next turn and we shot up toward the “bowl,” a 17-degree banked turn. I could hear Stull’s engine behind us and it sounded like he was making an outside move. I glanced to make sure he had not gotten beside us before using all the track to finish off the corner. Into the double-lefts of turns 14-15 we pulled a gap, but it was eroded in the slow right known as turn 16. Stull made a good exit onto the front straight and pulled alongside, but I could tell he would not be able to strike. I have found probably five different lines through turns 1-2, so I braked late, plowed over the curbs, slammed the throttle shut while hammering the bars to the right, then pinned the throttle wide open. The chassis gave a mighty protest and I could feel Gina bucking as she tried to hang on, but the rear tire eventually hooked up and off we went. Finally we got a gap and put in some clean laps. By lap five my right wrist was going numb and I began to worry about feel. Sure enough, on the final lap my leg began to lock up and my right arm was so numb I could not tell if the throttle was open except by listening to the engine. The fatigue level was a bummer, but Gina was actually still full of energy and ready and I was certain we could do better the next day. Sunday did prove to be better. This start left a wide-open line through the middle of the field and we were in 4th place by turn 3. We dove in on Wood Brothers Racing (Chris Wood/Aaron McEwen) on the brakes and were in 3rd. Stull was again leading Team 321’s Donn Sayre/John Heenan. I was disappointed to see their bike stretch it’s legs. I know their engine has fewer hours on it (ours is beginning it’s 4th season), but I still did not expect us to be so outmatched in straight-line power. We used the corners to reel them in and honestly I don’t remember where I made the pass for 2nd or for 1st; I just know that when we were beginning lap 2 I saw open track and said to myself, “calm and focus.” I attempted to drive smooth and fluid instead of straining. I was disappointed afterward to see that the first two laps were our fastest, because the calm I felt increased as the race progressed… I guess I was just a little too calm. We finished really far ahead of the field. I don’t know for sure if it was twenty seconds, but it was more than ten for sure. Head down and all alone. Team Johnny Killmore finished “The Bowl” in turn 13 as the sun gets low in the sky. Photo: Cali-photography. The event was a success. We had nine bikes, which is a good field for us (and we were missing Becker and another one of our regulars). The host club- CVMA- was happy with the show, and the solo bike racers seemed to have a really positive attitude as well. The Saturday night was a fantastic feast amongst friends also, but that is a story for another time. 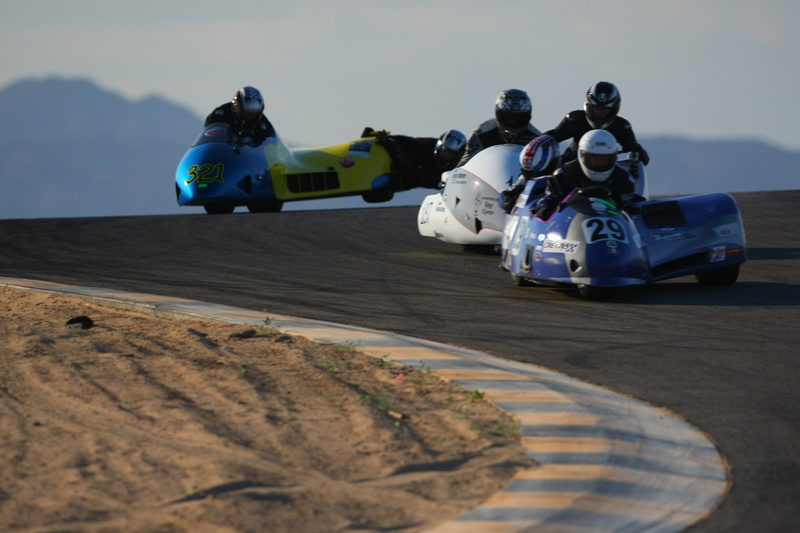 The season continues at Willow Springs Raceway April 27-29 with host club AHRMA. For all my Southern California friends I always say this is the one to come and watch if you want to see it live. There are vendors, a swap meet, bike show, and hordes of vintage bikes being raced in anger… from 1930’s hand-shift to modern Ducatis. From 160cc bikes that downshift for a headwind, to roaring 1200cc monsters that cut the air like an atomic sledgehammer. It’s a great show and the Saturday night party is among the biggest. Immediately after that we move to Northern California and the famed hills of Sonoma. 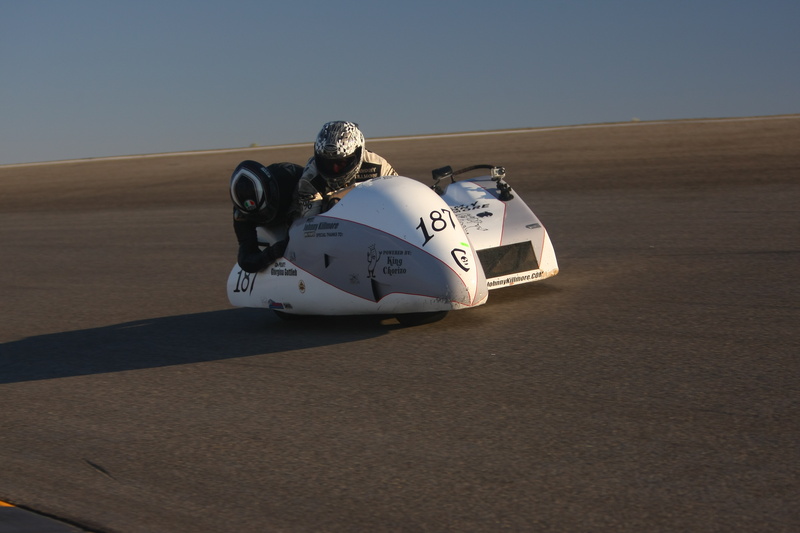 I have never raced a sidecar there and have not been on that course since 2008. If both Wade/Christine and Mark/Bobette show up, that will be the biggest fight of the season for us. Talented teams on similar machines battling on a great circuit. All the damned, slow right-hand turns are going to hurt us too, since we seem to be terrible at those. The next three weeks could be our most challenging of the year.